French wildlife and beekeeping: Eyes out for Grues cendrées, (Common Cranes). Eyes out for Grues cendrées, (Common Cranes). One of the more spectacular bird migrations in France if you happen to live on the flight paths is that of the Grues cendrées or Common Cranes as we call them in English. The Spring and Autumn migrations are completely different affairs but for several weeks now Cranes have been moving in ever increasing numbers in or through France as part of their Autumn movements BUT this is not a simple migration from A to B but more a gradual, partial, staggered affair with birds wintering at various locations stretching from north-eastern France (Lorraine and especially Champagne) to Morocco with various locations in between. The majority will end up in Spain with most of them in the large wintering areas of Extremadura. Weather conditions will determine the timing of these movements which can last until December; the only issue is accessibility to food on the ground which is principally the residues in maize fields that have been left untouched following harvest. Roosting takes place on the ground and is normally on marshy islands or marshy shallows on large lakes where the same site is used year on year. 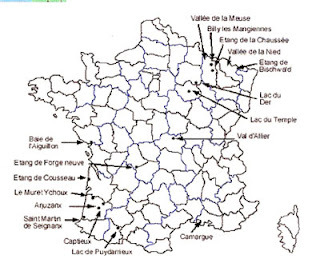 Some such as Lac du Der and Lac de la Forêt d'Orient in Champagne are huge at around 5000 hectares. 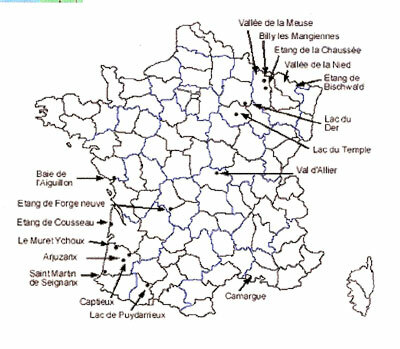 The map shows the principle sites in France where they stop over and /or spend the winter. In west / south west of France where I live the main sites for over wintering Cranes are La Mer Rouge at La Brenne, (Indre) near Le Blanc where some 3000 usually stay and some lakes just south of Bordeaux; (l'étang de Cousseau being the nearest for me), where overall about 28,000 cranes overwinter. One other site to the north of La Rochelle, at the Baie de l'Aiguillon (Vendée) hosts a small number of about 75 in recent years. There are also a number of other smaller lakes that host relatively small numbers of birds some only occasionally. Flights of Cranes can be as few as 3 or perhaps more than a thousand together but generally there are between 40 and 250 in a group although there can be many groups following close on each others tails. Spectacular as the flights are, and they are truly a wonderful sight to be seen, I would highly recommend taking the opportunity to see these birds in the winter in their feeding zones when on the ground if at all possible with their continuous comings and goings accompanied by that characteristic calling, and it's usually that calling that first draws my attention to them as it can be easily heard a couple of kilometers or more away and it's this constant distinctive calling that easily identifies them for anyone in doubt. This can also be heard when they pass over in the dark as they will fly day and night. European Cranes reproduce in 17 countries, in order of decreasing importance : Russia, Sweden, Finland, Poland, Biélorussia, Germany, Norway, Estonia, Latvia, Lithuania, Ukraine, Turkey, Republic Czech, Denmark, Romania, Britain, France. (very few in the last couple of countries but there are hopes this will improve). More about the Common Crane can be found here including links. There are plenty of videos on the web but this one gives a good all round view of them on the ground and in the air. Asian Hornet nest in a stone barn wall.